Despite what we see in movies and on TV, divorce and child custody cases don’t always go to court. Those situations certainly make for compelling fictional drama, but in reality, a variety of options exist beyond litigation. Called Alternate Dispute Resolution, or ADR, these strategies provide alternatives to trial. One of the most common is mediation. Mediation is a process used in civil cases like divorce and child custody disputes. The two sides come together, facilitated by a neutral third party, in an attempt to reach an optimal solution. You can use this approach when it comes to dividing property, establishing spousal support, child support, creating a parenting plan, and most other areas of family law. No, mediation is not legally binding. Even though you and your spouse agree to go through the process and settle a dispute this way, no decision is imposed upon anyone. There’s no concrete and final decree, and in the end, both parties must accept the terms. The mediator doesn’t pass judgment; he or she is only present to facilitate an arrangement between two people. In short, mediation in divorce is easier. At least if you and your spouse can act civil, play nice, and cooperate. The process is often much cheaper and faster than a long, drawn-out trial. It’s also much less stressful. Instead of presenting arguments and having a judge rule, in these cases, it’s usually a couple of people sitting in a room, working towards a common end. And if you can truly work together, many people feel better about the result—you’re part of the process, and it’s not just some outsider handing down a decree. In some cases, couples try mediation before moving forward with litigation. 4. 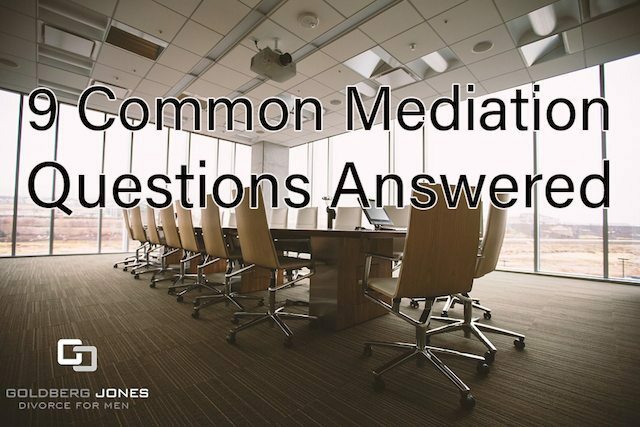 What Types Of Mediation Are There? When it comes to mediation, there are three types or styles to choose from. Each has its own peculiarities, and which is best for you depends on the circumstances. Evaluative Mediation: In this style, the mediator shows the parties how a judge or jury might view the case. The third party can point out weakness or deficiencies with a case, providing a better idea of what to expect from a trial. Facilitative Mediation: In the facilitative style, the third party essentially serves as a moderator. He or she helps the two parties to understand their options and reach a mutually agreed upon, beneficial resolution. Transformative Mediation: A transformative approach seeks to empower each party and to get each side to recognize the needs and point of view of the other. The mediator supports the two sides but allows them to determine the direction and structure of the proceedings. This is most common when both sides want to fix a broken relationship and mend fences. 5. Should I Hire A Lawyer For Mediation? One perk many see in mediation is that it doesn’t require a lawyer and the accompanying legal fees. That said, you may still want to consider hiring a divorce attorney, especially if your spouse has representation. A professional can consult and advise you during the process and steer you in the optimal direction. They can also make sure the agreement is fair before anything becomes official. Even if you do hire a lawyer, the cost will likely still be much less than litigation. 6. How Long Does Mediation Take? Another benefit of mediation is that it’s usually a much shorter process. Instead of a lengthy trial, most only last a day or two. Mediated cases tend to be less complex than those that go to litigation, but the process is also more streamlined. It’s often much more convenient, as you can schedule appointments to fit into your calendar rather than wait for the court to set a date. The mediation process is confidential. Conversations and communication between you and your spouse remain private. Moderators keep any information they receive confidential as part of their professional code of conduct. And none of the specifics appear on public court or legal documents. This is very much a behind-closed-doors proposition. Like most legal matters, however, there are exceptions. For example, incidents of child abuse or potential criminal actions that may harm someone. 8. How Do I Choose A Mediator? Much like most legal professionals, mediators often specialize in specific areas. If yours is a high asset divorce, look for one with experience in financial matters. When child custody is a big issue, find someone who focuses on that topic. If you hired a divorce attorney, he or she likely has local resources and can recommend someone to handle your case. 9. How Is Mediation Different From Arbitration? Arbitration is another form of alternate dispute resolution. Similar in process to mediation—two sides sit down with a third party instead of going to court—the two have key differences. While mediation is more collaborative, arbitration more closely mimics a trial. Both sides present evidence and make arguments, but the moderator has the power to render a decision. Like mediation, family law arbitration is voluntary. But in this case, the two sides agree in advance that any judgments are legally binding. Litigation in divorce is stressful, hectic, expensive, and presents a variety of other concerns. Fortunately, alternatives to this do exist, and mediation is one that many couples ending a marriage choose. It may not be the right fit for your specific situation, but it is an option worth consideration. If you have questions about your divorce or family law case and alternative forms of resolution, feel free to contact Goldberg Jones at our Portland office. Mediation sounds like a good alternative to a lengthy court case. I didn’t know that there were multiple types of mediation. Facilitative mediation sounds like the best option to me. It sounds like the outcome is beneficial to both parties which would be good. The majority of cases don’t wind up in court, and mediation is one common alternative to this that many divorcing couples choose.